Sunshine, blue skys and a new 100km loop programed in the GPS. Last night I had strung together a few of the roads I discovered yesterday into a neat little 100k ride with heaps of twisty roads and saved this as a route in the GPS. Todays ride was brilliant. Tiny rural roads and several faster B roads with very few straight bits or towns. I even had the opportunity to do some off road although this was not by choice. I was riding along behind a large tractor on a lane and a half wide country road. I had been behind him for a few hundred meters and could see the farmers face in the tractors huge mirrors. H ahd moved the right had side of the road continuing this way for some time providing ample passing room. So I slowly started to pass him. As soon as I was in line with him he decide the field looked inviting and veered left into me. My only choice was to head into the fresly ploughed field (read bog) to check out what he was so eger to see. Heart pounding and still upright I was OK but now truely bogged with my street oriented tires spinning uselessly in the mud. The farmer jumped out and walked over and started babbling in Danish. I understood the appology word but the rest was incomprehensible due to my ear plugs, helmet and weak grip on the laguage. I'm pretty sure it was the danish rendition of that timeless clasic "Sorry mate I didnt See you". Anyway, the framer gave me a push out and I was on my way again albeit with a little slice of Denmarks finest agricultural land coating my engine. I was surprisingly unphased by the whole thing largely due to the extremely low speed that it all took place. I didnt let it ruin my enjoyment of the remainder of the ride to Billund. Billund is the home of lego .. and pretty much nothing else. The town seems to be here for Lego and its airport. 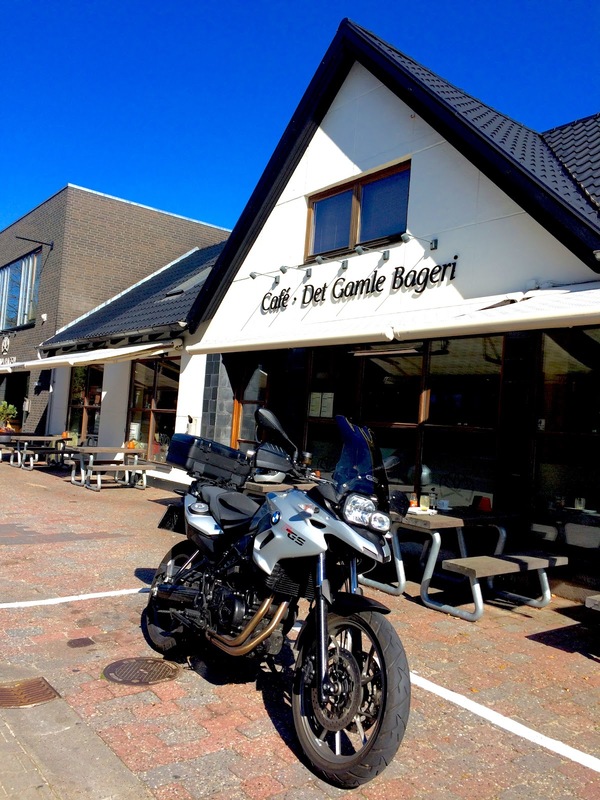 Its main street (Centrum) is small really small but it did have a bakery that served espresso. I ordered a latte with my now standard request that they use half the milk they were intending to use and sat out side to enjoy the sun. The late arrived still having twice the milk of an Australian latte but hey, it wasnt bad. I'll definitiely come here again but with frimer instructions to the staff. 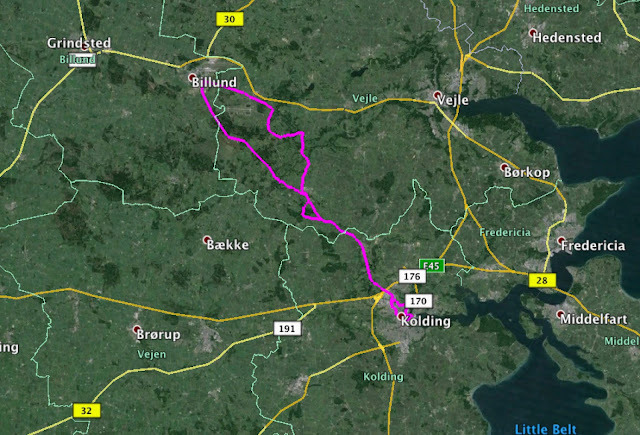 After refreshements I rode back to Kolding via more great roads some retraced from the outward journey.